When summer rolls around, so too do the need to pay particular attention to your cat’s health. Here at Wahroonga’s Fox Valley Animal Hospital, we do what we can to ensure your cat stays in perfect feline health all year round. Cats love a good sunbaking session. That doesn’t mean they don’t need monitoring and assistance on hot days though! You cat can be susceptible to heat stroke. In this case, prevention is always the best cure. Kittens, short-nosed breeds and obese cats are particularly prone to heatstroke. If you see heatstroke signs in your cat, please bring them to our vet clinic immediately for attention. The harsh Australian sun isn’t only dangerous to people. It can lead to skin cancer and melanoma in cats and dogs as well. Like humans, fairer pets can be at greater risk. Your white cats, blonde furred pets and ginger varieties are at higher risk. Yet, they can afflict any kind of cat or dog and should be taken seriously. Melanoma, squamous cell carcinoma and basal cell carcinoma are seen in both humans and cats. The latter is uncommon, but melanoma and squamous cell carcinoma can be quite common in cats and dogs. Skin cancer can be treated, as long as it is caught early and successfully identified by a vet. Lucky for Fox Valley Animal Hospital patients, Dr Katie is particularly well-versed in animal skin health and makes checking part of her regular pet health regimes. Preventing feline skin cancer is your best bet. Treating it can involve a vaccination, medication, surgery and treatments such as chemotherapy and radiation. Like any cancer, the quicker you notice the symptoms and seek treatment, the better chance you have. During summer time, you may notice a decrease or change in your cat’s diet. This is due to changes in your cat’s habits and metabolism. It’s estimated they can eat up to 15% less food than in the colder months. Try feeding your cat less food, especially if they are leaving it in the bowl. It may simply mean they are needing less food in summer. Cats can be sensitive about changes to their food. Dry food can dry out in hot winds. Wet food can spoil quicker. Both can attract bugs and become unappealing to your cat. This may mean that providing smaller portions throughout the day as opposed to larger main feeding times could be more useful during summer. Increasing your cat’s ability to stay hydrated is helpful during summer and this too can influence the kinds of food your cat should eat. Wet food can aid with keeping your cat hydrated for example, so supplementing a dry food diet with more wet food can help. Access to fresh water at meal times is also important. If you need guidance on your cat’s summer diet or you are looking for veterinary approved food, drop in to our Wahroonga vet clinic and let the vet nurses help you out. We have a great range of cat foods at the clinic. 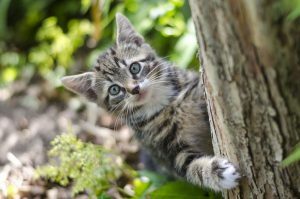 Your cat may be adept at finding the cool, shady places to rest in the garden, but these are also popular places for fleas to hang out. Summer in general sees an increase of both flea and tick activity. We’ve seen a lot of damage done to skin and cats lives placed at risk by ticks all year round due to the changing makeup of the seasons. We don’t expect that to change during summer, either. Wet days followed by baking hot days create humid conditions that encourage fleas to breed and ticks to become active. That’s why it’s important to have a strong, reliable flea and tick prevention regime all year around. Please don’t risk your cat to unnecessary exposure to fleas and ticks. Come into our veterinary surgery at Wahroonga and talk to our helpful vet nursing staff about what is the right feline flea and tick prevention for your cat. Maintaining your cat’s health this summer (and all year round) is our priority. We’re always available for advice on the phone and in person at Fox Valley Animal Hospital. Whether it’s been a while between check-ups or you have a specific question, get in touch with us. Our friendly team of vets and vet nurses are here to help. Contact us to discuss your cat’s health this summer on (02) 9489 4805 now.